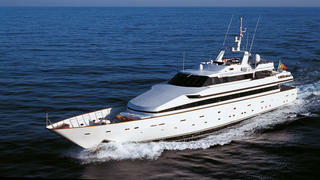 The 44.5 metre motor yacht Costa Magna has been listed for sale by Eric Trupheme at Ocean Independence. Built in steel and aluminium by Turkish yard Turquoise to Bureau Veritas class, she was delivered in 1986 and has proved to be a successful charter yacht. Accommodation on this yacht for sale is for up to 12 guests in five cabins consisting of a main deck master suite, two doubles and two twins plus two Pullman berths. All cabins have entertainment centres, television screens and en suite bathroom facilities. In addition, there are five cabins for nine crew. The main saloon has a rich mahogany interior, an intimate central seating area with two sofas facing each other, an entertainment centre and a bar while forward is a dining area with seating for 10 guests. Sliding doors lead out to the aft deck with full al fresco dining facilities at three separate tables and ample upholstered seating. Up in the sky lounge is L-shaped seating to port and starboard along with a wet bar, fridge and ice maker. Double sliding doors lead out to the upper deck with a large dining table and two coffee tables with banquette seating. The Jacuzzi deck is adjacent and has a Jacuzzi spa tub with banquette seats on either side. The 60 square metre flybridge comes with a helm position, sun beds and loungers, and a Bimini top while twin 867hp Detroit Diesel engines give her a range of 4,000 nautical miles at 12 knots. Available to view in Monaco, Costa Magna is asking €3,790,00.